If you had pick the single most important moment in characters arcs, what would it be? The Third Plot Point, you say? Well, you’d be right. Now here’s the harder question: Why is it the most important moment? The Third Plot Point is the low moment in your story. A minute ago, at the end of the Second Act, your protagonist seemed to have won a victory. Everything seemed to be going his way. He was getting the Truth figured out, and he seemed to have at least pushed the Lie to the back of his life. Even the antagonist appeared to be at his mercy. Cue the “happily ever after” sonata, right? Nopers. Because, as you know all too well by now, pushing that Lie to the back burner isn’t good enough. Before this story can end, that Lie has to reappear front and center and confront the protagonist head on. That’s what the Third Plot Point is all about. This low moment—this defeat, which is made all the more crushing because it comes on the heels of a seeming victory—will force the character to stop deceiving himself about the Lie. He can’t evade it anymore. He can’t pretend it away. He has to confront it once and for all—and either destroy it or be destroyed. 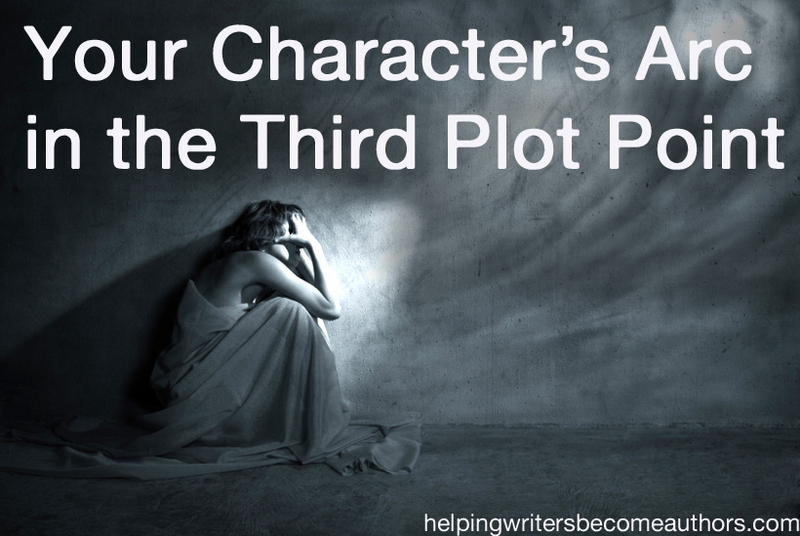 The Third Plot Point is a low moment for your character, a place of seeming defeat. The Third Plot Point forces the character to be absolutely honest with himself about himself. The Third Plot Point changes the paradigm of the story one more time. The Third Plot Point strips away any remaining veils and reveals to the character what the conflict is really about. The Second Half of the Second Act was a place of empowerment for your protagonist. His embrace of the Truth after the Midpoint allowed him to act rightly with more and more conviction (and success) throughout the rest of the Second Act. But after the apparent victory that closed out the Second Act, the Third Plot Point now forces a crisis—in both the plot and the character’s arc. This point of crisis is the result of a reversal enacted by the antagonistic force. The protagonist thought he had the bad guy down for the count, but the baddie’s got one more trick up his sleeve. Usually, this reversal is accompanied by a completely unexpected (although, of course, not unforeshadowed) revelation. Sometimes this revelation will be a plot twist, but often it will be nothing more than a sudden and full understanding of the protagonist’s Lie-empowered weaknesses. It’s this new information, as much as anything, that lays your protagonist open for the final blow. He’s so stunned he can’t even fight back. In plot terms, the Third Plot Point is all about creating a “physical” moment in which the protagonist’s plot goals are endangered. But in character terms, the Third Plot Point hinges upon not just “something bad” happening in the outer conflict, but rather an inner choice on the protagonist’s part. At last, after two long story acts, he must at last choose between the Thing He Wants and the Thing He Needs—between the Lie and the Truth. Throughout the Second Half of the Second Act, he convinced himself he could have both. Now, he realizes that’s impossible. If this moment is to bear its full weight in the story, it must be a soul-wrenching choice. Whatever the protagonist decides here, he will lose something vital. He can either choose the Truth and lose his dream. Or he can choose his heart’s desire and live the Lie for the rest of his life. The Thing the Character Wants needs to be within his grasp. It’s finally right there, in all its wonderful glory. He’s dreamed about it for so long. Now it’s his for the taking. All he has to do is close his eyes to the truth and reach out and take it. And he wants it so badly, the desire for it is practically killing him. The stronger your character’s yearning for the Thing He Wants at this point, the more powerful your Third Plot Point will be. [The protagonist] comes to understand both the promise and the price of the two ways. He comes, in other words, to truly understand his choice…. The moment of truth is not complete unless the hero understands not only what he stands to gain by choosing one option over the other, but also what he stands to lose. Since this is a positive change arc, your readers all know, deep down, what your protagonist is going to choose. But the harder his choice, the more readers will begin to doubt his final decision—and the more powerful his choice will be when he makes it. At this point, the choice must become more than decision; it must become an action. His convictions are so strong they force him to act upon them in a way that solidifies his new path. He must burn his physical bridges. After the Third Plot Point, he won’t be able to go back and change his mind in order to gain the Thing He Wants, even if his resolve should later weaken. Metaphorically, this moment is a representation of the character’s dying to his old self. Although he may still experience throughout the Third Act, he is, at this moment, so committed to the Truth that he’s willing to physically die for it. Indeed, he does metaphorically die, right alongside his Lie. The Third Plot Point will often feature actual death, either literally or symbolically. If an important character doesn’t end up literally dying here (as, for example, Obi-Wan does in Star Wars), death might be represented via life-threatening weather in the background, the character losing his job (signifying professional death), a pet’s death, a funeral on the road, or an obituary in the paper. The death motif must be organic to your story. The symbolism can never be arbitrary (e.g., the funeral the character passes on the road must have some connection to do with the plot). But the pall of death will almost always be, if not in the forefront, then hovering in the background of the Third Plot Point. How Does the Third Plot Point Manifest in Character Arcs? A Christmas Carol by Charles Dickens: On the stroke of midnight, just as Jacob Marley predicted, Scrooge is visited by the most terrifying specter yet—the Ghost of Christmas Future. The stink of death is miasmic in this section. Tiny Tim’s death is revealed. But, even more important, Scrooge’s death and its callous treatment by acquaintances and strangers alike, fills the Third Plot Point and most of the Third Act. Scrooge clearly sees the cost of his Lie and finally decides he will surrender his wealth and live the rest of his life honoring Christmas “in his heart” all the year ‘round. Cars directed by John Lasseter: Right in the midst of his newfound friendship with the townsfolk and possibly love with Miss Sally, Lightning’s Third Plot Point is thrust upon him. Doubting the sincerity of Lightning’s newfound virtues, Doc has called in the media. Lightning is given the very escape route he’s been craving all along. His ability to get to his tie-breaker race in time is practically gift wrapped for him. But, suddenly faced with the realization that the race may mean giving the peace and happiness he’s found in Radiator Springs, Lightning has to be dragged away. 1. What crushing event and/or revelation turns your character’s apparent success into the worst defeat yet? 2. How was this defeat enabled by the character’s refusal, thus far, to completely reject his Lie? 3. How does this defeat force your character to face the true ramifications of the Lie? 4. How can this defeat offer the character a clear path toward the Thing He Wants? 5. If he takes this path, how will it force him to reject the Thing He Needs? 6. How can you set up a clear and decided choice between the Thing He Needs and the Thing He Wants? 7. Which will he choose? 8. How can you literally or symbolically represent death in this scene as a way of reinforcing the demise of your character’s Lie-empowered old self? By this point, you should be able to see how the plot points steer your story around the corners of your character’s arc. The First Plot Point kicked him out of his Normal World and forced him to start reacting. The Midpoint woke him up out of his reactions and guided him into taking action. But that action was, at least partially, just an external response. The character spends the Second Half of the Second Act acting in the right way (for the most part), but he hadn’t yet quite learned his lesson. Deep down, he still believed he had several options open to him, even though there was only one right option for him within the story. That, as you’ve just learned, is why we need the Third Plot Point. The Third Plot Point rips away all those options and forces the character to a place where he has no choice but to be absolutely honest with himself about himself and about his situation. In the coming Climax, your protagonist will rise from the ashes, ready to do battle from a place of inner wholeness. The Third Plot Point is the place from which he rises. Stay Tuned: Next week, we’ll be talking about your character’s arc in the Third Act. Tell me your opinion: How does the tragedy of the Third Plot Point force your character to choose between the Lie and the Truth? Laser like precision in your analysis, as usual. Now to try to put all this to work in my own writing. Yes, that’s always the trick, isn’t it? It’s one thing to know something, and another entirely to actually do it! I’m super excited about this one! I hope my protagonist doesn’t get too upset when he’s forced to deal with his “lie” and forced to choose the thing he needs rather than the thing he wants:) Great post! On the contrary, we want him to get upset! His life is about to rocked to its core. Got shivers reading just your *description* of that big moment. Now if only I can carry that feeling into my current WIP. 🙂 This helps a lot. Thanks! I’m having a hard time deciding what my hero wants. I know what he needs, and I know what his family wants for him, and what the enemy wants for him……HE thinks he just wants to be left alone and allowed to do whatever makes him happy, with no responsibility, but I think he’s not so shallow. There’s more to him that that – something deeper drives him. I just have to find it. Sounds like you’ve already identified his want: he wants to be left alone. You can use that as background for whatever his plot goal is. He’s got to accomplish the plot goal, so he can *go back* to being alone. What if the protagonist seems to choose the Lie at the third plot point out of anger at another character/sheer stubbornness/misinformation? Is it plausible to ‘drag out’ his agonizing final decision for Truth until after he’s had a wake-up call/revelation? Or is it not technically the third plot point until he chooses the truth? I’m thinking of a movie with Adam Sandler where he wants to tell the girl he loves her (which would be choosing the truth) but sees her standing in the window admiring herself in her wedding dress in a mirror. He thinks she is too in love with her husband-to-be and that he was mistaken for having thought he could tell her the truth. He does eventually tell her…but even if the character chooses the lie AT FIRST, does it still count as the 3rd Plot Point? Just curious…=) Great post, as always! I’m not familiar with the movie, but it sounds to me as though he’s probably choosing the Truth, since he’s choosing a selfless action. The Lie is usually something internal the character believes about himself or the world. It’s not something external and concrete: She doesn’t love me. Rather, it’s something more incorporeal: I am selfish. So if, for example, Sandler started out the movie believing he was incurably selfish, he would, in fact be embracing the Truth by acting unselfishly in this plot point, regardless the fact he’s also acting according to an external (lowercase) lie. Out of curiosity, which movie are you talking about? Based just on the Wikipedia entry, I’m going to say that Sandler’s Lie has to do with love being based on external accomplishments (being a rock star). Therefore, his decision to selflessly give up Barrymore could be an illustration of his growing understanding of what it really means to love someone. Depending on the timing, I could also see the Third Plot Point being the moment when he breaks up for good and all with his ex-girlfriend. He acts on the Truth, then “pays for it” by getting the news that Barrymore is on her way to marry the other guy. I’d have to see the movie to really comment, so take these thoughts for whatever they’re worth. @Cecilia: Movies are a great tool for studying plot points, because their timing is so precise. The next time you pop in a DVD, take a look at the total running time, then divide it in fourths. Keep one eye on the clock. Every quarter of the movie, take note of what’s happening on screen. It’s almost certain to be a major plot point. In my novel’s current set-up, the third plot point is when my protagonist comes to fully understand the Truth. Will this have negative consequences to the timing of the plot? And is this something I should worry about before I even finish a first draft? You want the Truth to hit the character at the Third Plot Point. The rest of the Third Act is split between his reaction to the Truth and (in the Climax) his final implementation of that Truth. I’m trying to plan out a novel with a villain protagonist and a hero antagonist, and I’m very confused about where to put the highs and lows in my story. Should I plot the story with the low point for the hero at the third plot point, or should I plot the villain’s low point at the third plot point? Same goes for the midpoint. I’ve got the inciting incident pinned down, because that is the point where my protagonist/villain decides to actually start down the path to become a villain, but the rest of the plot points are really getting me confused. Help! A writer friend of mine pointed me to your blog, and I love it. I’m reading this blog series (writing character arcs) with wanton abandon. It has been so helpful to my writing. But when I got to this post, my brain sort of went ‘ca-chunk’. You see, my protagonist dies in Act 3. (I know, mean, horrible writer that I am. But I showed different endings to my writer’s group and they said unfortunately it has to happen). So I’m wondering if there are different questions I should be asking from this point on. The POV in the first act was the mentor, in the second act was the protagonist, and in the third act, it’s the antagonist. I know that sounds crazy, but it’s working very well. In that case, you’re probably looking at some sort of an overall Flat arc in which the protagonist’s Truth impacts the rest of the story world – and specifically the antagonist (who changes, I presume?). I’m a bit confused by this Third Plot Point — is it one scene, or can it be a series of scenes? I have to say– this series is so fantastic! I’m listening to the podcasts and referring back to these transcripts afterward, and it’s providing me a great education as I take on a major revision process of my novel. Thank you for demystifying the character arc! Although the central crux of the plot point itself will always be distilled down to a single red hot point *within* a single scene, this will very often be part of a larger sequence of scenes. All of the plot points are big deals, and they deserve to be BIG setpieces within the story. Sometimes, it’s possible to pull this off in a single scene, but usually you’ll end up with a sequence. At the very least, each scene in the entire story should be building so fluidly and organically into the other scenes, that they’re all ultimately interconnected anyway. Can the 3rd plot point point proceed after the 2nd pinch point? As an example, my story’s 2nd pinch point has the antagonist foil the protagonists first attempt to save his parents, and afterwards he has his low point (3rd plot point) when he’s locked up and feeling like he’s never going to save his parents and defeat the antagonist. I have read well the chapter about 2nd pinch point and the 3rd plot point in your book about character arcs. But now, writing my first draft (btw I write in German…therefore my lousy English here) I am confused about those two points. You say 2nd pinch point takes place on about 62% of the book; 3rd plot point 75%. Well, in my story the 3rd plot point comes directly after the 2nd pinch point. The antagonist seems to be defeated in a battle (victory) but as soon as the protagonist begins to celebrate the real desaster (and also the real antagonist) appears. All happens within one chapter. Do you think that’s ok or should there be more “story” between 2nd pinch point and 3rd plot point? It depends on how long the book is. If it’s very short, then yes, it might work to have Second Pinch Point, False Victory, and Third Plot Point all in one chapter. Otherwise, however, the pacing is likely to feel very rushed and the character actions/reactions undeveloped. Even though this is an old post I feel my question is relevant here. Must the protagonist of a positive change arc be absolutely sure that he will give up the thing he wants for the thing he needs after the third plot point point when entering the third act? For example, at the Third Plot Point, the character sees the truth, and wants to act on it, but he is either forced to go after the goal of the lie on threat of death, or he is still conflicted about giving up the lie for the truth. He will give up on the thing he wants for what he needs at the climax though. You’ve mentioned that rigidity to structure can sometimes be fatal to a story, but I also don’t want a fuzzy or convoluted character arc! Thanks in advance! By the way, even though I just started a few months ago, I’m all caught up on your podcasts! They’ve been very helpful for understanding story. Thank you! It isn’t so much that the character is *convinced* of the Truth at the Third Plot Point, but rather that events conspire to force him to *act* upon it–with consequences. He will then spend the rest of the Third Act in varying stages of wondering if he really made the right choice–if following the Truth was worth it. The final commitment to and certainty of the Truth won’t come until right before or during the Climax. Got it! I’ll need to rework a little but better now in the outline rather than in a revision. Thanks for your time! With all the different story structure books and information out there, I’m mixing terms and getting a little confused. Is the Third Plot Point the same thing as the Black Moment? Depends who’s talking, but, yes, the Third Plot Point is the low moment in the story, the point of despair within the character arc. What a wonderful website! I’ve learnt so much by reading your articles. I have a question. Does the Third Plot Point always has to be the lowest moment for the MC? For example, in Jane Austen’s “Persuasion” at 75% of the novel Ann (the MC) realises that Captain Wentworth (her love interest) still loves her. Although, she doesn’t get a chance to talk to him, because he gets jealous seeing her with Mr. Eliot and he storms out. In the next chapter Ann finds out from her friend that Mr. Eliot is a bad guy, but that doesn’t upset her, because she didn’t really like him anyway. So it seems to me that there is no low moment for Ann. I’d say it’s the lowest moment for Captain Wentworth, because he thinks that Ann is engaged to Mr. Eliot. P. S. English is not my first language. Sorry if there are any mistakes.